Your Guide to the Best Beaches of Aruba! Below you’ll find our selection of some of the best luxury hotels in Aruba. 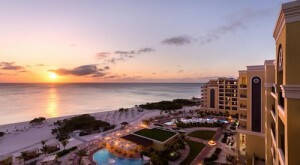 On the top of our list of the best luxury hotels in Aruba is The Ritz-Carlton, one of the newest Aruba luxury hotels. This luxurious five-star beachfront resort, just a few steps away from Palm Beach and Hadicurari Beach, offers modern rooms and suites with elegant furniture, a private bathroom and a balcony overlooking the Caribbean Sea, a minibar, and flat-screen TV. The resort has two swimming pools for children and adults and offers several watersport facilities. The resort features an exciting 24-hour casino that’s one of the best casinos in Aruba, with 19 traditional table games and a spectacular selection of slot machines. Downtown Oranjestad is just 10 minutes away from the beach resort for guests who’d like to go shopping, dining or just enjoy the Aruba nightlife. 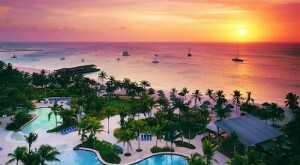 The 14-acre Hilton Aruba Caribbean Resort & Casino is ideally located directly on Palm Beach and is one of the most luxurious resorts on the island. All 350+ custom designed rooms feature Colonial furnishings, marble bathrooms, and private balconies or patios. The award-winning resort features 2 outdoor swimming pools, a fully equipped fitness center and oceanfront spa, and one of the best casinos in Aruba that offers slot machines, table games, and Poker tournaments every weekend. You’ll find a choice of 4 restaurants at the resort, all serving a rich variety of international cuisine. Private oceanside dining and 24-hour room service are also available. The resort also offers a tennis court, and a good game of golf can be played near the hotel at the par-71 Tierra del Sol Championship Golf Course. Guests can enjoy the Radisson’s dive facility and other water sports rental services. 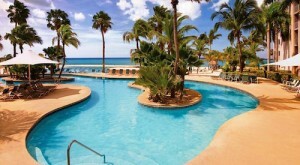 The Hilton Aruba Caribbean Resort & Casino has everything for that perfect Caribbean beach vacation! The oceanfront 5-star Hyatt Regency Aruba Resort & Casino offers nearly 360 elegantly modern guestrooms with large beds and flat-screen TV. 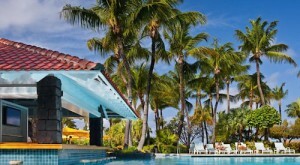 The Palm Beach resort offers direct access to the beach, a full-service spa, and endless casino action. The resort also has a spacious outdoor pool with a waterslide for children. Its spa features 8 treatment rooms where you’ll enjoy either an indoor or outdoor relaxing experience, after choosing your treatment from an extensive spa menu. Recreational activities can be found close to the Hyatt Regency Aruba Resort & Casino, including deep-sea fishing, sailing, and snorkeling. Enjoy your dinner at the beachfront Palms restaurant, or enjoy some delicious sushi at the Alfresco lobby bar. The Renaissance Aruba Resort & Casino offers both adults-only services at the Renaissance Marina Hotel and family lodging at the Renaissance Ocean Suites. A full-service spa, two casinos and a variety of fine restaurants are available. This beachfront resort offers free WiFi, satellite TV, and a coffee machine in each room. A private beach, a tennis court, a jogging trail and a fitness center are available for guests. Furthermore, the resort has three pools, and scuba diving or kayaking are on the list of possible activities. The resort is located in Oranjestad’s town center and just 5 minutes away from Reina Beatrix International Airport.